spa.gr.46.2, originally uploaded by Scottish Political Archive. This pamphlet is part of the George Robertson Collection within the Scottish Political Archive. 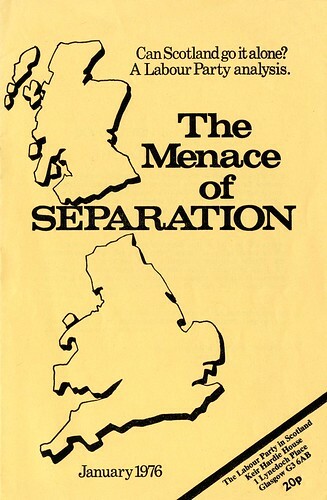 This ten page pamphlet was issued by the Labour Party in Scotland in 1976 and discusses the implications of full independence for Scotland. The archive is currently digitising our collections and making them available online through Flickr. The toolbar to the right of this blog shows the most recent additions to the online collection. However, we now have over 400 images available through this site. The bulk of this material comes from the photograph collection of the Scots Independent newspaper. The Scots Independent was established in 1926 and its photo collection contains about 1500 different images. Most of its photographs come from the 1960s onwards, the period when the SNP came to prominence for the first time, and include images up to the present day. The collection features prominent Nationalists like Alex Salmond, Winnie Ewing, Margo MacDonald, Gordon Wilson and Wendy Wood, as well as Scottish cultural figures like Hugh MacDiarmid and Iain Crichton Smith. There are also nationalist commemorations at Bannockburn and Elderslie, campaigns such as that over Gartcosh Steel works in the early 1980s and the return of the Stone of Destiny to Scotland in 1996. George Robertson delivered a lecture to MSc students on 11th October 2010. This lecture forms part of the spa oral archive and is available through our podcasting site. Please click on the link below to listen to George Robertson discussing his time at NATO. Welcome to the blog of the Scottish Political Archive (SPA). SPA was launched at the University of Stirling in October 2010. SPA aims to collect political material and archives from Scottish politicians and political organisations to chronicle the political history of Scotland in the twentieth century.